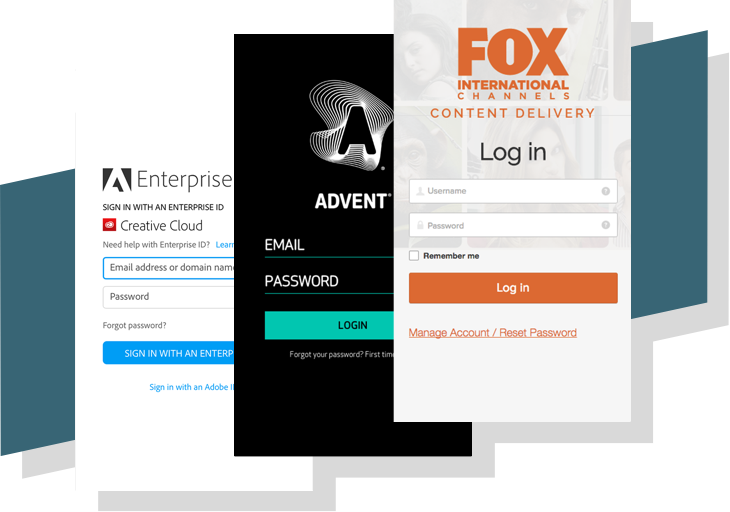 Get quick and robust authentication by adding one of our SDKs to your app or API service. Add one of our SDKs to your app. Store your data in Okta. Okta makes authentication straightforward. Connect your apps, choose an identity provider (or use ours), add users, configure rules, customize your login page, and then gain insights from our built in reports. Easily drop authentication into your app. Use our pre-built widget or customize the experience to match your brand. Social login with streamlined OAuth 2.0 connections, rich user profiles, and authorization allows end users to log in with something they already know. Support additional factors, including SMS, push verification, single-use passcodes, phone calls, and Yubikey. Build your applications using security best practices with industry-standard OpenID Connect support. Okta accepts unlimited inbound SAML and WS-Fed connections, creates JIT users, and manages and syncs user attributes so users can sign in with their existing identity provider. Our product is 100% multitenant and stateless, with an extremely redundant architecture, so our system will scale with you. Customize scopes, claims, and relationships between apps and users to control authorization in your APIs. Basic authorization is based on group roles. Set password and account recovery policies, including complexity requirements and lockout options based on group membership. Okta is fully OAuth 2.0 compliant, giving you the ability to protect resources and APIs, only allowing access based on granted scopes and permissions. Need to revoke access? Okta gives you control of the token lifecycle, allowing you to generate, validate, refresh, and revoke access. Manage your users in Okta or from any number of sources, including integrations with third party apps and user stores. Universal Directory, Okta’s user store, enables you to maintain all your users, groups, and devices in one place. Delegate authentication to AD or LDAP and enforce password policies without the limitation of the number of directories or domains. Grant access to the right person, with the right permissions, at the right time with our rules engine and contextual access management. Dynamically assign access and user roles based on group attributes. Use contextual information about the user to grant, deny, or ask for additional factors, like Google Authenticator, Yubikey, email, or Okta Verify. Get real-time reports detailing how your users are accessing your app and integrate with third party SIEMs like Splunk and ArcSight. Use Hooks to add custom logic to Okta. Customize your Okta policies and behaviors and trigger actions from Okta to downstream services with custom logic. From innovative startups to large enterprises, developers around the world trust our platform to handle their authentication.